Hi, I'm having an 18' CC welded using a Specmar Orca plan. The builder priced the package with a Merc 115hp but says it's up to me to choose the brand I prefer. I've had one good experience and one bad experience running Mercs. Are particular brands more reliable in the 115hp category than others? Is there a "consumers reports" for outboards? The local dealers are Merc, Yamaha, and Honda. Thanks! While this is an older thread I would like to follow up on it further. If 'minnlud' is still around I would love to know what he ended up powering his 18' welded aluminum with. 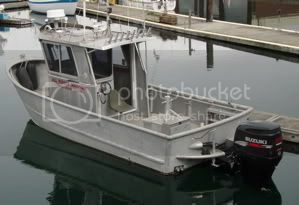 I am having an Orca - 2 center console (with 2' POD) built ( by www.jaspermarine.ca ) and have been told that 115-150 is the range of engine for it. The boat should be under 3000 lbs. I started thinking a 115 should do what I need it to but am second guessing myself as I would rather not have it under-powered either. I suspect jumping from a 115 to 150 is going to be noticeable in the fuel consumption though, so would like to figure this out as strategically as possible. Anyway, would love to hear what the 18' (20' overall with the 2' POD) welded aluminum crowd has found for power requirements. Unfortunately or fortunately, the Merc dealer up this way has a really bad reputation, leaving the options at Honda and Evinrude Etec. I have no issues with going with a Etec and they do offer the 135HO model, which may fit the niche nicely. Anyway, not looking to argue about engine makers at this point, just trying to figure out the best hp size :-) Thanks. ETEC 135HO will give you 148 HP. It is a good motor...I have one on my current boat. 115-150 should be sufficient. Thanks Fisherman. Can I ask what size your boat is and approximate weight? I keep wondering about jumping from the 115 4 cylinder up to the 135HO six cylinder and if the weight difference and likely somewhat increased fuel usage of the six is warranted. I know we all load, and use our boats differently :-) Maybe the old argument of you are better off having too much power versus too little is of some value. I have a 20' aluminum with softtop. Weighs around 2,400-3,500 lbs I think? I had a 90 hp on it and it pushed 33 top end. Switched it out and now hitting high 30's but a lot more torque and hole shot. Probably could switch the prop out and gain a few more hp if I really desired it. If you figure one horsepower for every 25-40 lbs of boat you should be close to sufficient. "Sufficient" becomes debatable, with large variants of interpretation among boaters.